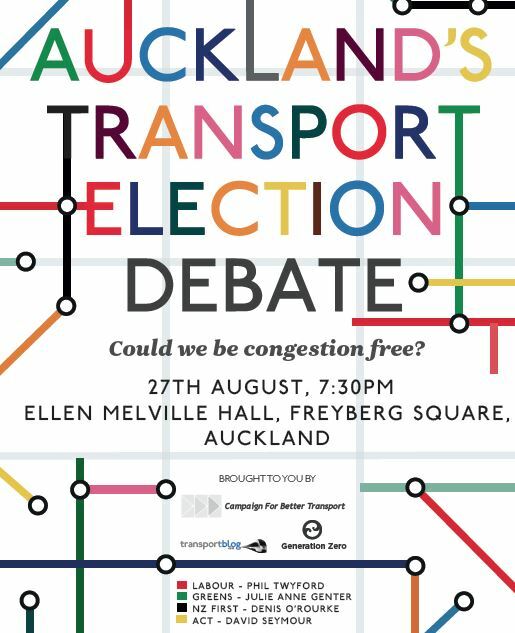 The Campaign for Better Transport, in association with TransportBlog and Generation Zero, is counting down to Auckland’s Transport Election Debate, on the 27th August. The meeting will be a chance for the public to find out from each party in the coming general election what they are promising to do for Auckland’s transport problems and options. “We are hoping for some solid transport policy for Auckland from each of the parties attending,” said Cameron Pitches, Convenor of the Campaign for Better Transport. Each speaker has been allocated ten minutes to speak, to be followed by questions from the floor from the general public. TransportBlog contributor Patrick Reynolds will also be on hand to talk about the Congestion Free Network, a public transport focussed initiative that focusses on moving people effectively around Auckland at peak times. Sudhvir Singh, a medical doctor and a leader of Generation Zero, is looking forward to the event. “Young people are demanding that we learn from past mistakes when it comes to transport funding. A liveable low-carbon city is entirely possible if we are smarter about transport and give people choices,” said Dr Singh. Representatives from Labour, the Greens, NZ First and ACT will be attending. National’s transport spokesperson and current Minister of Transport Gerry Brownlee is unable to attend due to prior diary commitments. Organisers are hopeful that National will be able to put forward an alternative spokesperson. “Nationwide, more than $2.5bn is collected in fuel and road taxes every year, and these taxes are increasing year on year. The public needs assurance that the Government after the 20th September will be spending our tax dollars on the right projects,” concludes Mr Pitches. Pioneer Women’s and Ellen Melville Hall, Freyberg Square, Auckland Central. Wednesday 27th August, 7:30pm sharp. Building access from 6:00pm. Help spread the word about our election debate and download the flyer here.